hirty and forty-mile-an-hour winds didn ? ?t stop the Lady Redskins from taking 4Th Place at the Scott City Varsity Girls Tennis Invitational on Monday, September 20th. Competing teams included Wakeeney, Ulysses, Colby, Tribune, Garden City, and two teams from Scott City. Led by Senior, Susan Nguyen, the lady Redskins earned 13 team points behind Scott City with 16, Tribune with 19, and Wakeeney with 23 points. All girls battled through tough, windy conditions all day. #1 Singles ? 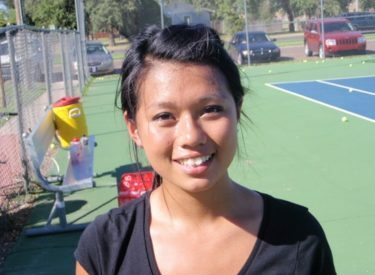 ?Susan Nguyen went 3-0 on the day finishing in 1st Place. She defeated Ulysses ?? Dazie Johnson 6-0, defeated Wakeeney ? ?s Jackie Albin 6-3, then found herself down 1-5 to Tribune ? ?s Shalee Myers. Avenging a loss from last year, Susan battled back to tie the match at 5 games all. In an exciting tie breaker, Susan earned the first place metal winning 7-5. #2 Singles ? ?Kathy Nguyen went 3-1 finishing 3rd Place. She lost to Tribune ? ?s Megan Reding 0-6, bounced back to defeat Scott City ? ?s Callen Rice 6-2, defeated Colby ? ?s Janessa Williams 6-4, then defeated Garden City ? ?s CeCe Ramsey 6-5 (7-4 in a tie breaker). #1 Doubles ? ?Lauren Harp and Desirae Courkamp went 0-2 on the day. They lost to Ulysses ?? Rivera/Moore 2-6, then lost to Tribune ? ?s Greeson/Nemecheck 1-6. #2 Doubles ? ?Katie Plunk/Kassandra Rosales went 2-2 finishing 5th Place. They defeated Scott City ? ?s Rodriquez/znguyen 6-0, lost to Wakeeney ? ?s Brunswig/Hafliger 2-6, lost to Garden City ? ?s Kyaw/Boudhara 2-6, then bounced back to defeat Scott City ? ?s Wilkcoxson/Craig 6-3 to finish 5th Place. The Lady Redskins travel to Garden City on Saturday.